MODERN MESH SCREEN DESIGN – The mesh book holders are not only stylish but are super practical too. 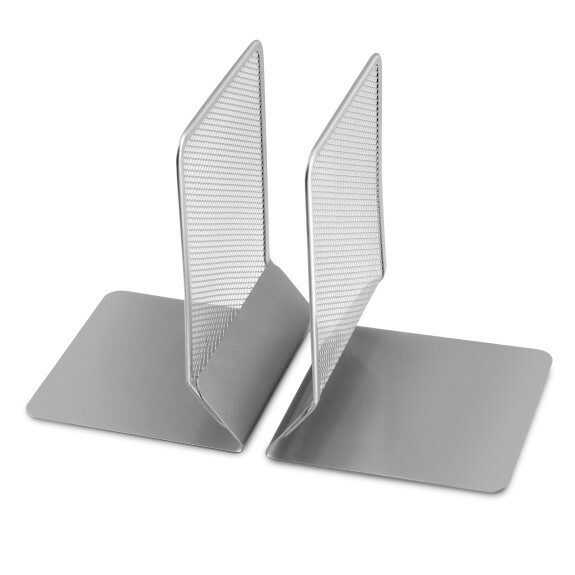 Keep books on your desk for easier reference with these steel mesh bookends. The steel rims and angled bases offer a professional look and keep your books upright and ready to use. No more rummaging through piles of books or papers. YBM HOME OFFERS UNPARALLELED HIGH QUALITY - Unlike plastic bookends or flimsy thin metal, these are made with sturdy stainless steel. The pair of bookends is powder coated with a matte black finish and offers a minimalist look for your space. It’s time to add some style, efficiency, and productivity to your home or office! Measurements: Length 5 In. Width 5.25 in. Height 7 in. ✔️ Holds Large Books – These extra strong sturdy metal bookends are ideal for even the heaviest of books. They wont bend or break like other cheaper versions! ✔️ Mesh Design – The plain black mesh design adds a minimalist, modern style to your home or office. Not too plain and not too fancy just right.